We're pinning pictures and tutorials from around the Web onto a Pinterest board to help inspire you! Click the red button; check it out; and follow us! Got An Announcement? Show it HERE! If your NG has a special event, project or community service that you want to announce or remind members, you can have it publicized in this space. ASG Chicago Chapter Website – Find more information about the Chicago area chapter, including neighborhood groups and events on our website. 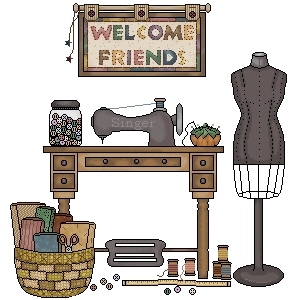 Desperate Stitchers – Joliet’s neighborhood group blog. Sew Chicago – Downtown Chicago neighborhood group’s blog. The City of Chicago is hosting some exciting fashion related events starting Monday, April 28 and, the best part, these are free! April 28 from 5 pm to 9 pm screening of the film of Men of the Cloth and a panel discussion with the director and members of the bespoke tailor community, and a networking reception. Free admission and the event Claudia Cassidy Theater, 77 E. Randolph St.
May 3-4, 2014 Saturday, 10am-6pm. Sunday, 11am-5pm. FashionChicago® (Spring 2014): Shopping Event in the Tent. Join StyleChicago.com in the tent at Millennium Park on Saturday (10am-6pm) & Sunday (11am-5pm), May 3-4, 2014 for FashionChicago®, an amazing designer shopping event featuring more than 30 of Chicago’s finest fashion designers – all under 1 tent – in the heart of downtown Chicago. Free admission for this event in Millennium Park – Chase Promenade North, 201 E. Randolph St.
July 22-23, 2014 Fashion Focus Chicago Sidewalk Sale. The Chicago Department of Cultural Affairs and Special Events presents the eighth annual Chicago Sidewalk Sale on July 22 and 23 at Daley Plaza from 9am to 3pm daily. The two-day shopping event will offer fashion enthusiasts and bargain shoppers an assortment of affordable apparel and accessories from Chicago designers and independent boutiques. Free admission for this event in Daley Plaza, 50 W. Washington St.
Are you ready for the Sew Spring Fling 2013? It’s that time of year again. Time for Spring Fling 2013! This year’s fling takes place April 27th at St. Isaac Jogues Church, 8149 Golf Road, Niles, IL 60714, 9:00 a.m. to 2:00 p.m. Admission is free. Feel free to bring guests. Members can buy, sell or donate fabric, patterns and sewing books. Whistle Stop Demos are a wonderful opportunity to learn new sewing techniques. Everyone is welcome and we look forward to seeing you there. Members interested in selling fabric please click here for information and to obtain fabric inventory forms. Congrats to ASG Chicago Chapter Member Rhonda Buss! Rhonda is the winner of the Sew it All Casting Contest. Rhonda will demonstrate a dress on an episode of Sew it All TV that will air in April of 2014. Check out her audition video. Congrats again Rhonda!!! The 2013 Ticket to Paradise Grand Prize went to Eve Kovacs of Woodridge, Illinois, who used patterns from Saf-T-Pockets to create a skirt and jacket ensemble. At the International Textile Expo in Las Vegas, March 18-20, the Independent Pattern Company Alliance presented its annual sewing contest fashion show and awarded the top prizes to the contest winners. Each year, the IPCA’s contest challenges sewers to select patterns from one of the IPCA member pattern companies and then unleash their imaginations to create garments inspired by the contest theme. The 2013 theme was “Ticket to Paradise”, and contestants were encouraged to make garments that express their idea of “paradise”. The winning garments were selected from a field of finalists during the Sewing & Stitchery Expo in Puyallup, Washington, earlier in March. Add yours to our album!